Am I a resident for tax purposes? This article was written by a tax practitioner specializing with individuals’ income tax returns. This piece of legislation is not straightforward, therefore this article gives information that can help with an objection. If you have been asked by your South African employer to work in another country for an extended period of time while the payroll was still done in South Africa and taxes have been deducted against your income and paid over to SARS, we would love to hear from you. We started running this a few years ago as pilot project and now have become specialists in dealing with these cases. The reason? It can yield massive refunds, is technical and complicated, is a specialized service and both the taxpayer as well as our practice can benefit greatly from filing these returns. As indicated above, this type of work is technical and complicated so please do not try to do this work yourself unless you have experience in getting this exemption allowed and you know how to navigate through the process of having your income exempted. The reason we say this is due to the objection rules as published during 2014. If not done correctly, the objection could be rendered as invalid by SARS with an invitation to re-lodge an objection within a period of 20 working days. If not done, then the assessment may become final and the tax benefit lost in full. Also, we have had many invalid objections by SARS for reasons beyond the employee’s control and have been able to successfully navigate past the objections SARS had using the income tax act, specifically, section 82 which deals with the burden of proof. This section – We refer to this as Section 10 (1) (o) (ii) or Section 10 exemption for short, is broken into 2 parts which can become very confusing and subsequently often a problem when put to SARS in the form of an objection. Part 1 – Proving that you qualify for the exemption and the 12-month period in question. It is important to note that the 12-month period of exemption generally does not run along with the tax year which is March – February. Often, this period starts before or after the tax year and continues for a period of 12 months. It is this period that needs to be clearly identified. That a person was with “any employer” (therefore, an independent contractor would not qualify for this exemption as by law they are not recognised as an employee and also not a person in public office) employed in a country outside South Africa and has been outside the country for more than 183 days in total in the 12-month period as well as more than 60 days continuously. These days are calendar days and not working days. This part must not be confused with the part that deals with the exempt amount referring to the number of working days in the 12-month period (in SA) and the number of working days spent working in another country. Part 2 – Demonstrating the amount of the exemption – This step could be straight-forward, or this step could be complicated and often is. It all depends on a case by case basis. If the employer has split the income earned in SA and the income earned outside SA under the correct SARS codes and the amounts could be re-calculated to match the IRP5, then the case is a lot simpler but if not, then the case just got more complicated. Remember that the 12-month period of a tax year which is between March and February and the 12-month period of exemption for “foreign services” rendered do not necessarily correlate with the tax year. As result, it cannot be argued that the full amount on the IPR5 as the exempt amount should be isolated and objected to in order to have the amount exempted. If this cannot be done, then we cannot see how SARS would allow this exemption. Also, often employers bundle the full income for the year, whether relating to foreign income or SA income, on the IRP5 with the general codes. (Not the SARS sources codes for foreign income) When this is done, SARS issues an invalid objection asking the employer to correct the IRP5 and which very seldom can be done by the employer as the employer would have to redo their payroll submissions to SARS for the entire company and simply refuse to do so. It is as this point where interpretation of the income tax act and skill are required as well as an understanding of the objection rules. We have often overcome the above by submitting a new objection and referring to Section 82 of the income tax act which states that the burden of proof is with the taxpayer showing that an amount of income is exempt, or a person is not liable to tax being charged on an amount. We have interpreted the wording of this section and have written letters to SARS giving reasons the amount should be exempt and stating that we have discharged of the taxpayer’s burden of proof and as result of this, the condition of the section was met, and the exemption should follow. In some cases, we had to argue this in an appeal but have had great success using this approach. If the coding on the IRP5 is not a problem, then often the objection is made invalid in any case based on other reasons. These could be a statement by SARS that the days requirement was not met, that the amount of the exemption is incorrect, the wrong code was used when submitting the objection or any other reason. A new objection may have to be filed again (or an appeal) interpreting this legislation and the taxpayer’s situation against this legislation motivating the reasons the objection should be allowed. Sill, according to rule 9, an objection can be disallowed, and a reason given in which case, an appeal has to be filed. Lastly, we often have employers not fully understanding the ins and outs of this section and therefore the exempt amount to be calculated could be incorrect, the codes used by the employer could be incorrect and issuing letters required during the objection could be incorrect and may need refinement. Often employers do not fully cooperate with these requests or they can take some time. Anticipating the documents before any objection is submitted should be well documented and as much information as possible that would be required during the objection be gathered. If such calculation has to be done (and they should be done) one will have to count the number of working days in the foreign country as well as in SA during the period of exemption and this percentage would then become the exempt amount. Again, any delay in the process could cause rule 7 of the objection rules to become a problem. An objection has to be submitted within 30 days of the assessment and within 20 days of SARS issuing an invalid objection. The principals of this Section 10 work the same whether the employer is a SA employer or not. 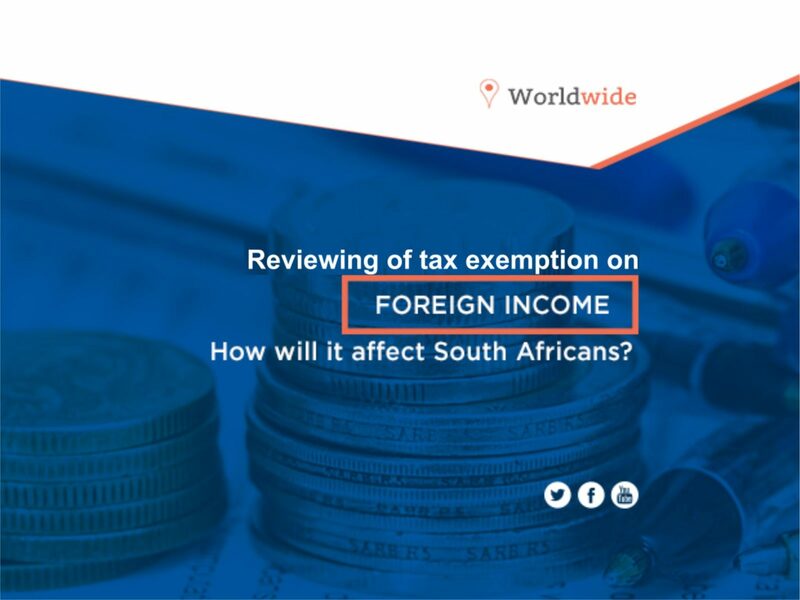 The case becomes more complicated where PAYE has been withheld from the taxpayer’s income and paid over to SARS and such amount is effectively requested back by means of “foreign income” earned being exempted. The same degree of care should be given whether PAYE has been deducted or not, it is just easier to get a case through the system where there is no refund than where there is a large refund. Our top refund amount for such a case stands at just over R800 000 for an engineer that was working outside South Africa and earned a salary in excess of R2 m.
Contact us if you need help with your tax exemption. Should I file my own tax return?